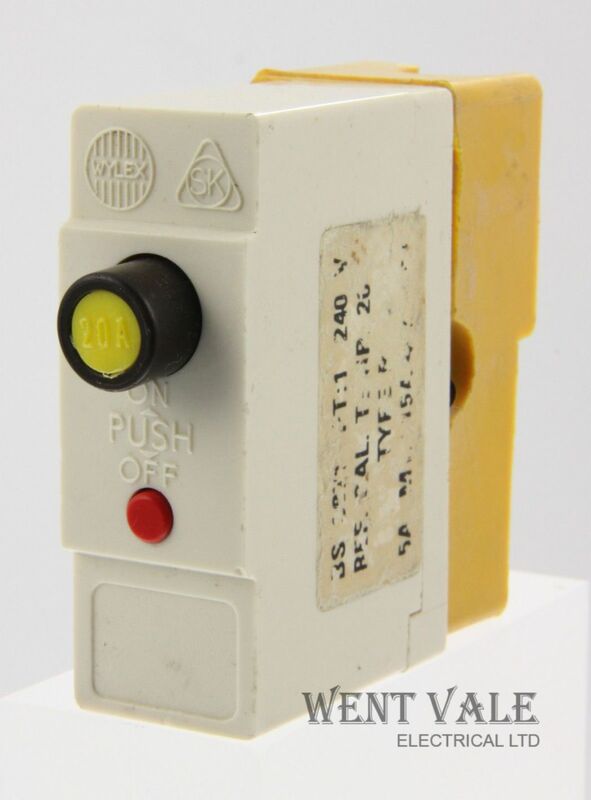 The Wylex - 20a Plug In MCB replaces your existing rewirable or cartridge fuse. Designed to fit Wylex Standard Range Consumer Units but will fit other makes of consumer units . Comes complete with colour coded contact shield. Used but in fairly good, full working condition. Please note there is a small drawback to this type of MCB. As the small red reset button is not protected from the environment it does get affected with dirt and grime over the years and may not pop back out after use, an occasional wipe with a barely damp cloth and a small spray with WD40 will aid stopping this from occurring. If there is any problems with breaker being reset, a very slight tap with the handle of a small screwdriver usually does the trick along with a quick clean. You can pay by the following methods:PayPal, Direct Bank Transfer (BACS) (pleaseask for our account details) & we take credit or debit cards payments over the phone. For deliveries outside the UK . International postage will be shipped via a Royal Mailtracked shipping method dependent on the destination country. Heavy, valuable or large parcels will be shipped with thelarger courier services but these tend to be costly, so you must ask for aquotation before purchase, and let us know how quickly you need the goods asthis greatly affects the price. Please Note: The postage quoted is for both the cost of the postalservice used and the costof packing materials used , please take this into consideration when leaving DSRratings. Inclusive postage is offered onthis listing by combining the item price and the postage & packing costs.If this option is chosen it will be sent out via our basic postage methodappropriate to the value of the goods. If you require ‘Royal mail Signed for’delivery or ‘Special Delivery’ guaranteed next day delivery then please chooseeither option. I use mainly my ownstock photos so the picture on the listing may differ to the actual listeditem, but will be a match. On rareoccasions we may, during cleaning and final inspection, that an item is founddamaged after the sale is made. If this was the last in stock and we have analternative item we will inform the buyer and send the alternative one out. Add me to your favouritesellers list and subscribe to my email product updates. Please note WentVale is not registered for VAT, so we are unable to provide VAT invoices. Youmay obtain all the necessary paperwork from your ‘My eBay’ purchase historysection ‘View order details’. It isrecommended that this item and all my other electrical items are installed by aqualified electrician. The seller takes no responsibility for injury/damage topersons or property due to incorrect selection or installation of equipment.